I’ve been doing this challenge for the past couple of years and have had a lot of fun. However, this year, I’m going to try and be a little more consistent with doing monthly updates and what not. I don’t know about everyone else, but when I first started book blogging, I didn’t know that many authors in my favored genre, so I went looking. I gave myself a goal of finding 50 new authors and ended up reading 56 the first year I did this. I loved finding these new worlds and cultures, so I want to help others find new ones as well. Since 2007, I’ve tried over 100 different authors I may not have tried otherwise and I have found some great new authors. 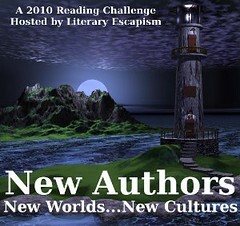 The idea behind this is to find new authors that you’ve never tried before. They can be in your genre of choice or be brave and try something new. You never know what you’re going to like until you try it. If you’re looking for some suggestions, you can check out the Author page here at Literary Escapism or the 2009 Challenge page. With over 1000 reviews posted, I’m sure there will be something there for everyone.